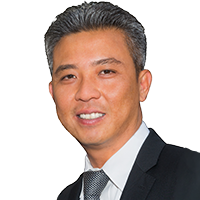 Darren Nguyen - C.E.O A solid background in architecture, enhanced by comprehensive experience in banking and accruing formidable real estate negotiation capabilities, Darren shaped Advance Estate Realty into one of Orange County’s most well-rounded one stop shop real estate powerhouse. His all-encompassing skills pertaining to the business have resulted in an impressive accumulation of quality agents and clients – all of whom have reaped the benefits of Darren’s broad scope of knowledge and tireless work ethic. Having an architecture degree prior to launching his career as a licensed banker, Darren’s work is consistently organized and detail-oriented, ensuring that every sale and contracts experience a smooth, efficient transaction, whether they’re buying or selling a property. No matter how complex the transaction, Darren is adept at delivering smooth, rewarding experiences that are defined by results. This rare level of expertise has enabled him to be one of the top individual real estate professionals within Orange County for the past decade. A firm believer that product knowledge is key to any real estate sales transaction, Darren is an expert when it comes to custom homes in the Orange County area. Additionally, he’s confident that his familiarity with the nuances of each neighborhood in the Orange County area is unmatched. This specialized knowledge is complemented by prior experience with construction, through which he learned even more detailed information regarding the building of high end properties. An integral part of Advance Estate Realty since its launch in 2002, Darren has helped usher in a new standard for real estate in Orange County. With his team at ADK Bancorp Inc. and Adore Escrow Inc., Darren strives to transform the seemingly complicated task of real estate transaction into a smooth and memorable experience.